The Bush administration attempted to move the immigration debate in Congress further to the right when top White House aide Karl Rove and Senate Republicans proposed new legislation March 29. The plan would create two new temporary worker programs and relegate less skilled immigrant workers to systems of servitude. Undocumented workers could be legalized, but would initially be given only provisional status with limited allowance for family members. The transition of undocumented workers from provisional status to permanent resident status would be subject to large fees and fines (as much as $18,500 per person). For new legal resident visas, “merit points” based on work skills would take priority, favoring the upwardly mobile, while permanent resident visas for family reunification would be severely reduced. New immigrant workers would not be allowed to bring family and would not be able to transition to permanent residency. Historically immigrant workers have demanded equal salaries with native-born workers as they integrate in the U.S., especially as their families aspire to equitable incomes and purchasing power. The Bush plan, like slavery, indentured servitude and bracero programs have in the past, seeks to block such processes of integration and assimilation. 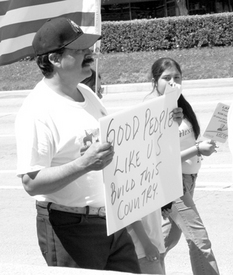 John Sweeney, president of the AFL-CIO, said the plan is “unacceptable on all fronts … and will lower standards for all of America.” He added, “It guarantees inequality now, for 12 million undocumented workers, and it guarantees inequality for those immigrants who come to our shores legally in the future.” The AFL-CIO is opposed to guest-worker programs. Rep. Luis Gutierrez (D-Ill.), as a compromise bipartisan measure, introduced a much more immigrant friendly bill, HR 1645, with 22 liberal and moderate Democrats and seven Republicans as co-sponsors. The bill includes border security, worker identification, undocumented legalization and a temporary worker program with paths to citizenship, and retains family reunification as a priority. Gutierrez’s bill will be part of the open deliberative hearing and drafting process of the House Judiciary Subcommittee on Immigration, chaired by former immigration attorney and professor Rep. Zoe Lofgren (D-Calif.). Labor, Latino, and immigrant advocacy groups are concerned that Gutierrez’s bill has made too many compromises with pro-business forces and reflects the punitive approaches of Republicans. “The president’s plan is clearly aimed at holding together a Republican united front in the Senate that would be able to block any immigrant friendly provisions by keeping them from having 60 votes willing to have debate and a vote on the issue,” said Alvaro Huerta, communications director of CHIRLA. Currently there are 49 Democrats, 2 independents and 49 Republicans in the Senate. The Bush administration with the Senate Republican leadership has been able to keep labor rights, human service, student rights, health care benefits, and other “New Direction” legislation supported by Democrats, from getting the 60 votes needed for debate and vote in the Senate.